Orenchi no Furo Jijou episode 6 changes course from the last few weeks and doesn’t introduce a new sea creature/boy. It doesn’t even feature either of the newer boys we’ve come to boy-love and expect either! 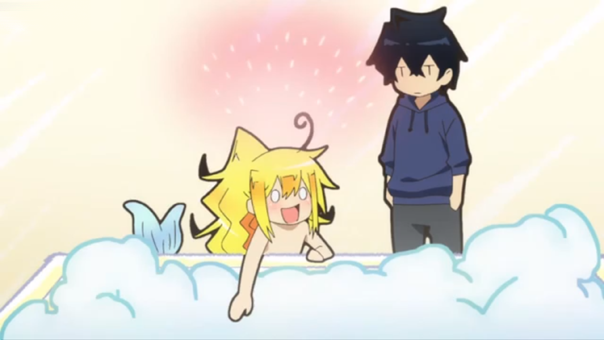 Tatsumi and Wakasa take a bubble bath. Well, Wakasa takes one alone first but tells Tatsumi it’s a waste if they don’t both enjoy it, which they eventually do. Unfortunately, a bubble fight later and they are out of bubbles. Then, while Tatsumi is drying off, Wakasa slips in more bubble packages and BOOM! The house is destroyed. Cute, uneventful, and half the episode is just opening and closing credits. I’m giving it a 5. Would you give it more or less? Explain in the comments below!